· Overall, 1992 was a poor agricultural year. After having stagnated in 1991, global agricultural production only rose by about 1 percent in 1992. Except for North America, Oceania and the Near East, where production recovered from shortfalls experienced the previous year, regional agricultural performances ranged from mediocre to weak. · Developing countries' agricultural production rose by only 1.7 percent, about half the average growth rate of the previous ten years. · Among developing country regions, only the Near East achieved some gain in per caput agricultural production (1.6 percent), which was, however, inadequate to compensate for the region's losses of the previous year. In both the Far East and Latin America and the Caribbean, gains in agricultural production were entirely eroded by population growth. Africa recorded a 6 percent fall in per caput agricultural production, largely on account of the drought that affected developing southern Africa. · Agricultural production in North America recovered significantly (up by 7.5 percent, compared with -1 percent in 1991 and a yearly average growth of 1 percent during the previous ten years) and accounted for more than 80 percent of the world's total production increase in 1992. Production also rebounded in Oceania (3.6 percent, three times the trend rate) but remained virtually unchanged in Western Europe. · Eastern Europe and the former USSR recorded yet another year of production decline: it was the fifth in six years in the former USSR, bringing the cumulative decline since 1987 to nearly 15 percent, and the third consecutive decline in Eastern Europe, with the overall fall in this region between 1989 and 1991 being more than 18 percent. While in the former USSR the shortfall in 1992 was chiefly due to a contraction in livestock production, that in Eastern Europe mainly reflected drought-affected crops. · The overall poor agricultural production performance of developing country regions was also reflected at the country level. No less than two-thirds of all developing countries recorded stagnant or declining levels of per caput food production. · As has so often been the case in the past, the highest concentration of poor performances was in Africa, where all but six countries suffered per caput production losses. In some cases these were catastrophic, all the more so since they followed similarly dramatic crop shortfalls in the previous year. This was the case of Mozambique, Somalia, the United Republic of Tanzania and Zimbabwe. The few bright spots in the region included Chad, Ghana and, more significantly - given the population involved - Nigeria. These countries achieved sizeable gains in per caput food production for the second consecutive year. · Among densely populated countries in other regions, Brazil, China and Indonesia continued to expand food production significantly, while Egypt, India and Turkey recorded poor to mediocre performances in per caput food production for the second consecutive year. · World cereal production in 1992 increased by 4.2 percent to 1 959.3 million tonnes following the decline recorded in 1991. Most of the expansion occurred in developed countries, where production rose by 6.6 percent to 890.7 million tonnes. The bulk of this increase was accounted for by a significant recovery in production in the United States and a partial recovery in the former USSR after the major contraction experienced by both in 1991. In the United States, production increased by 73 million tonnes (26 percent), while the increase in the former USSR amounted to 33 million tonnes (22 percent). Production in developing countries, on the other hand, increased by only 2.3 percent to 1 069 million tonnes. · World cassava production rose significantly in 1992, especially in Asia and Africa. The outlook for 1993 is for continuing growth in global production. Some increase was reported in world production of pulses. 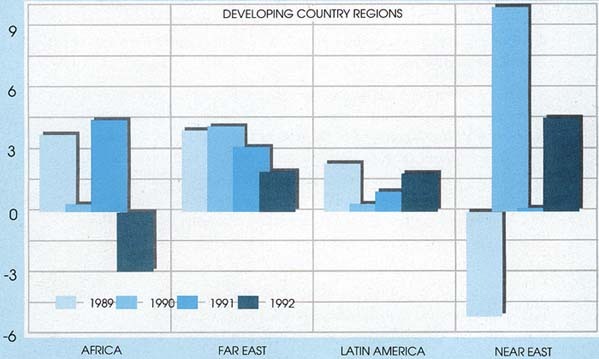 A decline of more than 3 percent in the developing countries was offset by a sharp increase in the developed countries. · World production of fats and oils increased by 3.2 percent in 1992 to 84.9 million tonnes, a marked improvement over the sluggish growth of the previous year. Output in the developed countries rose to 39.5 million tonnes, led by an increase in the production of all oilseeds in the United States and of rapeseed in Canada. There was also a significant recovery in olive oil production in the EEC, while production of cottonseed, sunflowerseed and butter fell sharply in the former USSR. For the developing countries, output increased to 45.4 million tonnes, largely as a result of the sizeable recovery in soybean production in Brazil and the continued growth of palm oil production in Indonesia. Total output of fats and oils increased modestly in both India and China while palm oil production in Malaysia was stagnant for the second consecutive year. On the other hand, declines in output occurred in soybean and sunflowerseed production in Argentina and in coconut oil production in the Philippines. · World production of centrifugal sugar (raw value) in 1992/93 declined to its lowest level since 1989/90. A lower output was registered in all major cane sugar-producing countries, except Brazil and Australia, mainly because of poor weather. Cuba's harvest is estimated to be only 4.5 million tonnes, against 7 million tonnes in 1991/92, the lowest level since 1963. · Meat production increased slightly in 1992, as a larger poultry and pork output outweighed the reduced output in bovine and ovine meat. The outlook for 1993 is for a continued growth in world meat production and trade. There is still considerable uncertainty about the impact of policies in major exporting countries, notably connected with the mid-1993 implementation of the Common Agricultural Policy (CAP) reform in the EEC. 1 Crop year beginning in the year shown. · World milk production decreased by 2.5 percent in 1992, following a similar decline in the previous year. Production dropped in Europe and the former USSR, while it increased in North America, Oceania and Japan. In the developing countries, drought severely curtailed production in the southern countries of Africa, but production increased in Latin America and Asia. · At 5.7 million tonnes in 1992/93, coffee output recorded a 5 percent decline from the previous year's level. Falling prices, which during the first nine months of 1992 fell to the lowest level in more than 20 years, caused a reduction in the use of agricultural inputs, a neglect of crop husbandry and a decrease in yields. Sharp reductions of output were recorded in Brazil, Guatemala and Mexico while a new record crop was achieved in Colombia, mainly because of temporary price support from the National Coffee Fund. 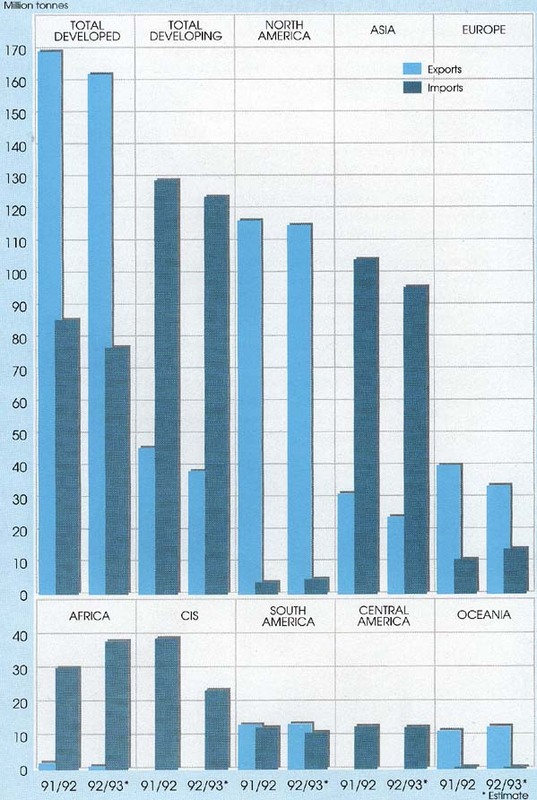 Smaller crops were reported in major African producer countries except Côte d'Ivoire. · In 1992/93, cocoa output recovered by more than 4 percent to 2.4 million tonnes. Increases in Africa and the Far East offset a slight decline in Latin America. In Côte d'Ivoire, the world's major producer, output remained roughly unchanged from the previous year. Ghana's production was 17 percent above the previous season's level but below the peak of 1988/89. Good weather conditions favoured a recovery in Nigeria's output. · World tea production fell by about 4 percent to 2.5 million tonnes. Smaller harvests were reported in India, Sri Lanka, Indonesia and Kenya and other countries of East Africa. In Sri Lanka, severe drought conditions and serious damage to tea bushes in several parts of the country resulted in smaller harvests and could even affect the 1993 crop. Drought also affected eastern countries of Africa, including Kenya, Malawi, Uganda and Zimbabwe. The only major producer country where an increase was reported in 1992 was Bangladesh, mainly because of new plantings coming into production. · World cotton output declined by more than 11 percent to 18.4 million tonnes, more in the developing (-12.4 percent) than in the developed countries (-8.6 percent). The decline was due to the response of producers to considerably lower prices, which were down from the high prices of 1989 and 1990. China's unusually high production levels in 1991 could not be expected to be sustained. The former USSR continues to face market disruption as well as environmental problems in cotton areas. · World production of jute, kenaf and allied fibres fell sharply to the smallest crop since the mid-1970s: 3.1 million tonnes. This was less than half of the previous peak of 6.5 million tonnes in 1985/86. Severe droughts in Bangladesh and India were the main cause of the sharp decline. · World output of rubber increased by 3.7 percent to 5.6 million tonnes, with output expanding in all major producer countries except Malaysia. Thailand continued to show the fastest growth (12 percent) among the major producer countries. In Africa output also rose strongly, especially in Liberia. By contrast, output in Malaysia declined further because of unfavourable weather, depressed prices and high labour costs. · Africa is still the continent most seriously affected by food shortages requiring exceptional and/or emergency assistance. Fourteen countries in the region are currently facing exceptional food emergencies and, significantly, half of these countries are also being affected by civil strife. · In Somalia, the distribution of relief supplies to parts of Mogadishu has been severely disrupted. Despite prospects of an improved main-season crop, hundreds of thousands of people continue to face acute difficulties in meeting their basic food requirements. · In Angola, the civil war has had disastrous consequences for national food security. Fighting has disrupted and paralysed marketing. Only international support for relief food distribution will prevent widespread suffering. · Aggregate cereal production rose in southern Africa but several countries harvested below-average crops. Despite a larger crop than last year, the food supply situation will remain serious in Mozambique as there are several million displaced persons and returnees whose consumption needs can only be met by relief food. Below-average crops in Lesotho and Swaziland point to continuing food supply difficulties in both countries. · Serious difficulties are still reported from the southern Sudan, where recent population displacements have exacerbated the situation. Food problems continue in Rwanda where the uncertain security situation has prevented displaced persons from returning to their homes. In Kenya, given the uncertain crop prospects, substantial food aid may be needed in 1993/94. · Other African countries requiring exceptional or emergency assistance include: Eritrea, Ethiopia, Liberia, Mauritania, Sierra Leone and Zaire. · In Iraq, the food supply situation has substantially deteriorated. A recent FAO/WFP mission found that, despite some recovery in cereal harvests, a vast majority of the Iraqi population, suffer from persistent deprivation, chronic hunger and endemic malnutrition. The low-cost food rations distributed by the government are inadequate, while food prices on the open market are well beyond the purchasing power of most of the population. · In Europe, Bosnia and Herzegovina continues to face serious food shortages. As commercial deliveries of essential supplies have been curtailed, there is almost total dependence on UN relief convoys, and the food situation remains extremely tight owing to distribution problems. Food shortages requiring exceptional assistance have also been reported in Albania and the Former Yugoslav Republic of Macedonia. · Numerous other countries are facing shortfalls in food supplies requiring exceptional or emergency assistance. These include: Afghanistan, Armenia, Cambodia, Georgia, Haiti, Laos, Lebanon, Mongolia, Peru and Vanuatu. · World cereal production in 1992 is estimated to have increased by 4.2 percent, reaching 1 959 million tonnes. With rice converted from paddy to milled basis, this corresponds to 1779 million tonnes, as shown in Exhibit 5. · World cereal utilization in 1992/93 increased by an estimated 2.3 percent, remaining below 1992 production. 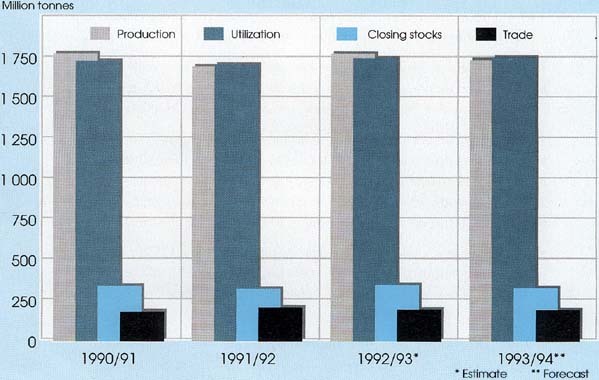 This resulted in a buildup of global cereal stocks in 1993 following the drawdown over 1991/92. · World cereal carryover stocks at the close of crop years ending in 1993 is estimated to be 351 million tonnes, 24 million tonnes or 7 percent above the level of 1992. Most of the increase occurred in developed countries (from 170 million tonnes in 1992 to an estimated 193 million tonnes in 1993). In the United States alone, cereal carryover stocks increased by 31 million tonnes, to 78 million tonnes, as a result of the major pickup mainly in coarse grain production in 1992. Stocks in developing countries are estimated to have expanded by approximately half a percentage point. · The estimated level of global cereal carryover stocks in 1993 corresponds to 20 percent of the forecast trend utilization in 1993/94. · Cereal output in 1993 is forecast to be 1929 million tonnes, about 1.5 percent below the good harvest in 1992. All of the contraction is expected in developed countries, where production is forecast to decline by 30 million tonnes to 861 million tonnes. Developing country cereal production would remain stable at a forecast 1 068 million tonnes. · Most of the projected contraction in cereal production in 1993 is expected to be in coarse grain production, about -3 percent, while wheat production should contract by about 1.5 percent. Paddy production is tentatively set to increase by slightly less than 1 percent. · As a consequence of the forecast contraction in cereal production in 1993, global supply and demand for cereals is projected to be more closely balanced in 1993/94 than in the previous marketing year, and world cereal carryover stocks may again have to be drawn down in order to meet expected cereal utilization in 1993/94. Thus, carryover stocks at the end of the 1993/94 marketing year may decline by a projected 19 million tonnes to 332 million tonnes. This corresponds to 18 percent of the projected trend utilization. · World trade in cereals in 1993/94 is forecast to be 201 million tonnes, almost equal to the estimated volume in 1992/93. · Developing countries' imports are forecast to increase by 1 million tonnes to 125 million tonnes, while their exports should increase by 1.5 million tonnes, leaving their net imports almost unvaried at 85 million tonnes. · World trade in wheat and wheat flour (in wheat equivalent) is forecast to increase by an estimated 2 million tonnes to 100 million tonnes. Imports by the developed countries are expected to rise by 1.5 million tonnes to nearly 33 million tonnes, while aggregate shipments by the developing countries are forecast to rise only marginally, to more than 67 million tonnes. · Among the developed countries, wheat shipments to the CIS are forecast to rise from an estimated 15 million tonnes in 1992/93 to 17 million tonnes in 1993/94, while total wheat imports into Europe are forecast to decline by 1 million tonnes, to 5.8 million tonnes. · Among developing countries, the most significant variations in wheat imports are expected in Asia, where imports are forecast to decline by 2 million tonnes, to 33 million tonnes, mainly as the net result of sharply reduced import requirements in India and an expansion of exports from China. An expansion of imports by 1 million tonnes is expected in Africa, mainly reflecting larger purchases by Morocco, while total shipments to Latin America are forecast to rise only slightly. · World trade in coarse grains is forecast to fall by 2 million tonnes to 88 million tonnes, reflecting a decline in developed country imports of 2.5 million tonnes. Developing country imports should rise only slightly. · Among developed countries, an expected 2 million tonne increase in coarse grain shipments to the CIS will be more than offset by smaller imports into Europe, North America and South Africa. · Developing country imports of coarse grains are expected to increase marginally to 47 million tonnes. Unfavourable weather conditions in parts of North Africa may result in larger imports into Algeria and Morocco, while the return to more normal production levels in southern Africa should lead to smaller coarse grain imports into sub-Saharan Africa. Total coarse grain imports into Asia are forecast to remain near the level of 1992/93. Significant increases are expected in Latin America, mainly Mexico and Brazil. · The forecast for world rice trade in 1993 (calendar year) is 12.7 million tonnes, as compared with 13.8 million tonnes in 1992. Developing country imports should contract from 11.1 million tonnes in 1992 to 10.2 million tonnes in 1993, while those of developed countries should fall slightly from 2.7 million tonnes in 1992 to 2.5 million tonnes in 1993. · External assistance flows to agriculture have tended to decline in real terms in recent years, despite a moderate upsurge in 1991. This applies both to commitments and the much lower figures of actual disbursements - the latter following the former with a lag of several years. · Commitments of external assistance to agriculture in 1991 (the last year for which complete information is available) reached $14.3 billion. At constant 1985 prices this represented $9.1 billion, only slightly more than the low amount committed in 1990. · The concessional component of external assistance to agriculture continued to decline, representing 70 percent of total commitments in 1991, down from 75 percent in 1990 and 76 percent in 1988. 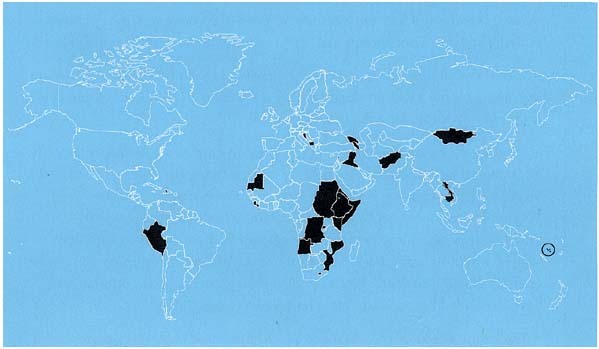 · Bilateral commitments in 1991 totalled $4 billion (at constant 1985 prices), nearly 11 percent above the level of 1990. By contrast, multilateral commitments declined slightly. All bilateral commitments, and nearly half of multilateral ones, were concessional in character. 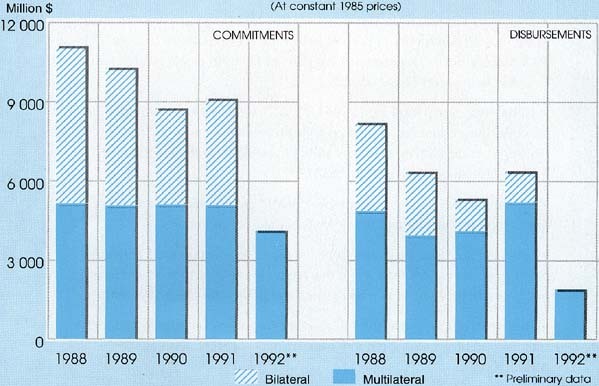 · Preliminary information for 1992 suggests a sharp decline in multilateral commitments (19 percent at constant prices). 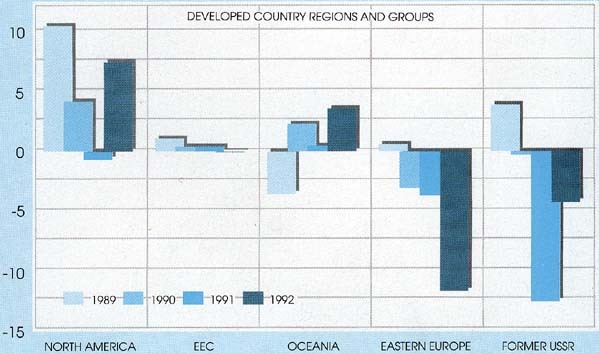 The decline reflected reduced commitments by the World Bank and, to a lesser extent, UNDP/FAO/CGIAR. By contrast, regional development banks were estimated to have expanded their commitments with respect to 1991 levels. Information for bilateral commitments and disbursements in 1992 is not yet available. · Shipments of food aid in cereals during 1992/93 (July/June) are estimated to be 12.8 million tonnes (5 percent below the previous year's level of 13.5 million tonnes), representing 0.8 percent of world cereal production and 6.4 percent of world cereal imports. · Of the total cereal food aid in 1992/93, 11.1 million tonnes were destined for developing countries, compared with 11.9 million tonnes in 1991/92. 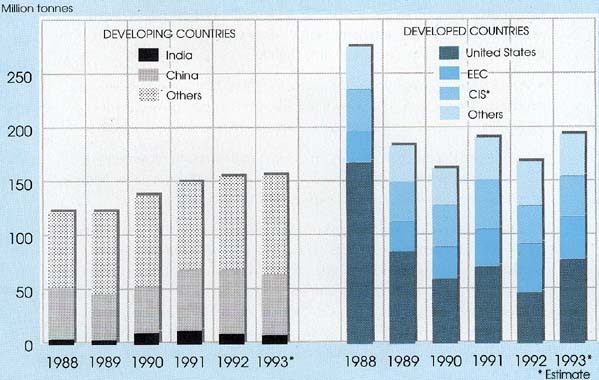 Deliveries to developing countries still remain significantly less than the 13.5 million tonnes delivered in 1987/88. · Food aid to developing countries in 1992/93 represented 1.2 percent of their cereal production and 8.9 percent of their cereal imports. · Sub-Saharan Africa continues to be the major recipient of food aid. As much as 60 percent of food aid to this region is intended to meet emergency needs of refugees and displaced persons and of drought-affected countries. · Shipments of food aid to the CIS and East European countries in 1992/93 is estimated to be about 1.7 million tonnes, about the same level as the previous year. · As of 24 May 1993, pledges to the 1993 International Emergency Food Reserve (IEFR) amounted to 562 496 tonnes of food commodities, of which 501 641 tonnes were in the form of cereals and 60 855 tonnes in the form of other foodstuffs. · In addition to IEFR contributions, 650 904 tonnes of cereals and 78 550 tonnes of other food commodities had been pledged under the subset of WFP regular resources for meeting the requirements of Protracted Refugee Operations. · As of May 1993, total pledges to WFP's regular resources for the biennium 1993-94 stood at $618 million, representing 41 percent of the pledging target of $1.5 billion. · World catch and culture of fish and shellfish in 1992 stabilized at the level of 1991, i.e. 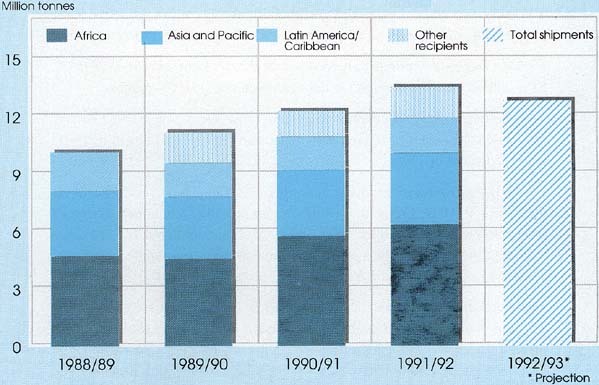 96.9 million tonnes, following declines both in 1990 and 1991. · World marine fish production declined for the third consecutive year to 81.5 million tonnes, although the decline was a marginal 0.4 percent. · World inland fish production continued to grow, increasing in 1992 by an estimated 2.1 percent compared with expansion rates of 3.8 percent in 1991 and 5.7 percent in 1990. · Among the five major producer countries, only Chile and China expanded production in 1992. China, the world's largest producer, continued its rapid production expansion, which increased by 11.2 percent to reach 14.6 million tonnes, while Chile's production increased by an estimated 6.1 percent to reach 6.4 million tonnes. · Production in the former USSR contracted by an estimated 16.8 percent to 7.7 million tonnes. This brought the cumulative decline since 1989 to 32 percent. In Japan, production dropped significantly for the fourth consecutive year, falling to 8.4 million tonnes, 9.7 percent below 1991 and 30 percent below the peak of 1988. 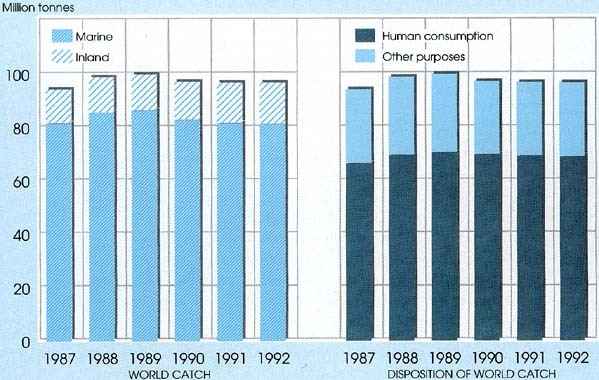 · Estimates of the disposition of world catch in 1992 record a marginal decline of 0.3 percent in fish for human consumption, following declines of 0.9 percent in 1991 and 1.1 percent in 1990. · In 1991, international trade in fishery products grew less in terms of value than volume because of lower prices for some commodities, including shrimp and salmon. 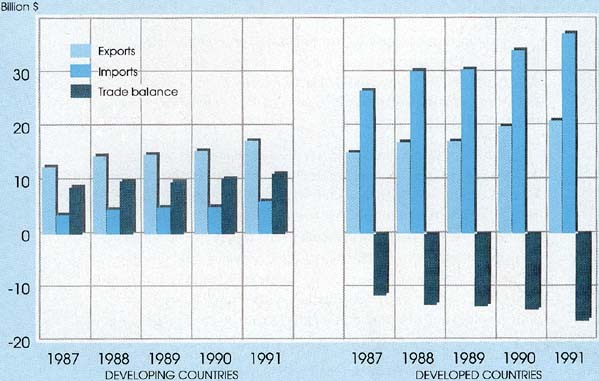 Exports in 1991 reached $38.5 billion, up from $35.8 billion in 1990. · Estimates for 1992 are for an increase in the value of fish traded to more than $40 billion, a trend which is expected to continue in 1993. The share of developing countries in world exports of fishery products is estimated to remain stable at around 46 percent. · Developing country exports in 1991 represented 34 percent of their total catch as compared with 43 percent for developed countries. In spite of this, developing countries as a group recorded an increasingly positive trade balance in fish products, which reached $11.3 billion in 1991; while the developed countries' position as net importers of fish products continued to accentuate strongly, with their exports only accounting for about 60 percent of their imports in 1991. · World production of roundwood increased marginally above the depressed level of 1991, mainly reflecting the continuing fuelwood production growth in the developing countries and the recovery of industrial roundwood markets in North America. Demand for industrial roundwood and mechanical wood products in Japan and Western Europe remained weak while it continued to fall sharply in the former USSR and some East European countries. 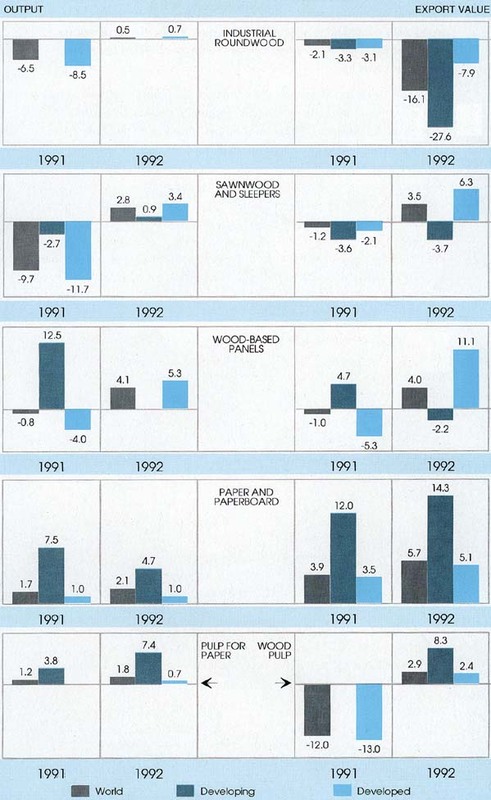 · Production of sawnwood and wood-based panels increased in the developed countries, led by the North American recovery, but remained well below the level of 1990. Some major tropical timber producers are facing increasing environmental problems in the use of their natural forest resources, which is constraining their production of wood products both for the domestic and export markets. Environmental concerns are also limiting log supply from the old growth natural forests of the northwestern United States, thus favouring the use of the recently established, cultivated forests of the southeastern region. · The pulp and paper industry continued to expand, albeit at a slower rate than in the late 1980s. Production in the developing countries continued to grow markedly, with dynamic performances in Brazil, Chile and several countries in Southeast Asia. · Lower utilization of capacity, low prices and poor profitability characterized the pulp and paper markets. The increasing trend in the use of waste paper continued, backed by legislative and policy measures in a number of countries, and this may have contributed to the reduced utilization of wood pulp capacity. · The value of trade in forest products recovered after two years of stagnation. Notable gains were recorded by Canadian coniferous sawnwood exporters who increased their exports to the United States by 15 percent to reach 31 million m3. Exports of coniferous logs from the United States continued to be hampered by the reduced log supply from the Pacific northwestern region, caused by the set-aside of timber land for, environmental reasons. These exports, mainly directed to Asian countries, dropped by a further 13 percent, causing a steep price increase for coniferous logs and sawnwood in international markets during the first part of 1993. · Trade in tropical timber continued to decline in 1992, as major exporters, such as Peninsular Malaysia and Indonesia, deliberately reduced their exports of logs, sawnwood and plywood through the imposition of limits, quotas or levies. This policy aims at increasing exports of processed products such as mouldings, furniture and furniture parts. · Trade in paper products continued to expand in 1992, reflecting in particular increasing exports from Europe and the United States. Trade in wood pulp continued to stagnate, as prices for major grades remained depressed because of increased competition from recycled fibres and excessive capacity. · In early 1993, the Malaysian state of Sabah temporarily suspended its log exports while, in the state of Sarawak, logging in tropical forests has been severely curtailed since 1992. Lower timber supply from the main Asian producers contributed to a sharp increase in prices of tropical timber in the first part of 1993.